The distressed look is not unique to fashion and furniture. Many crafts and home décor elements incorporate this distinct, stylish look. Show your creativity and turn an old book into a piece of art with distressing techniques. Give the book as a gift or use as a decoration. Choose a hardcover book since paperbacks are too flimsy to sustain the process of distressing. Use a hardcover book with a board cover. 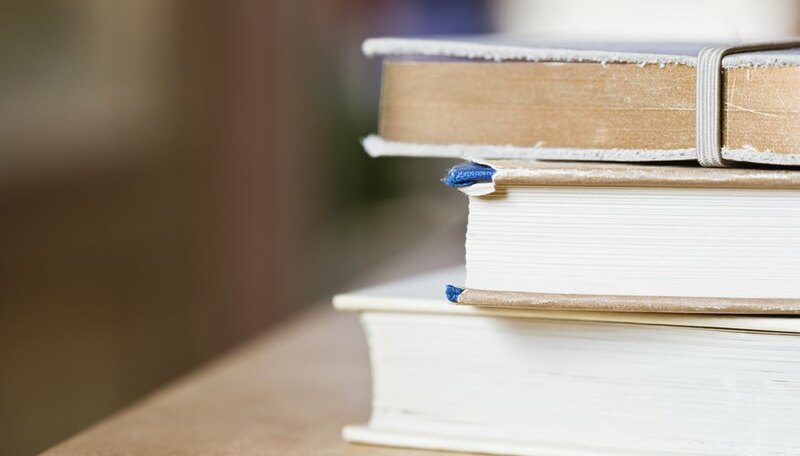 Avoid leather or fabric hardcovers, which cannot be distressed. Mist the cover (both ends) with water to give the book a weather look. Spray just enough water to bleed any ink on the cover, but avoid over-saturating. Allow the cover to dry. Cut or soften the sharp corners of the book. Cut the tip of each corner with a pair of scissors to expose the threads of the cover and show wear. Alternatively, show wear by softening the corners by hitting each corner against a hard surface. Add other signs of wear, such as coffee stains or splashes of paint. Wet the bottom of a coffee mug with coffee and place on the book cover. Allow the mug to sit for an hour to create a ring. To add splashes of paint, dip a tooth brush into paint and then flick onto the book cover. Embellish the book, if desired. Apply scraps of postage stamps or torn scraps of newspaper. Crumble a page of a book, flatten the page and glue onto the cover. Add distress ink to the cover to make it look more aged. Apply different colors of distressed ink pads to the cover and spray with water to allow the inks to mix and blend. Let dry.